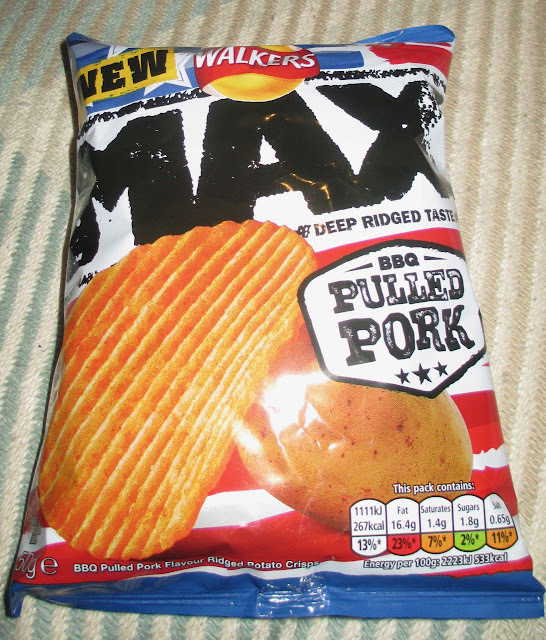 These new Walkers Deep Ridged BBQ Pulled Pork flavoured Potato Crisps remind me of the last time I ate pulled pork in a restaurant. It was fairly recently at a new steak restaurant not too far from where we live. I was looking forward to a big steak and chips dinner, but on reading through the menu I thought I’d try the pulled pork for a change. I did enjoy it, but the restaurant has burnt itself down since, so I can’t help regretting not having their specialist steak and for pudding their traditional Key Lime Pie. On opening the rather smart packet with the Star Spangled Banner of the USA behind a huge deep ridged crisp and a slightly smaller potato (which I wasn’t trying to think of Geometrically wise until typing that phrase! ), there was a sweet barbecue smell from the reddish deep ridged potato crisps inside. 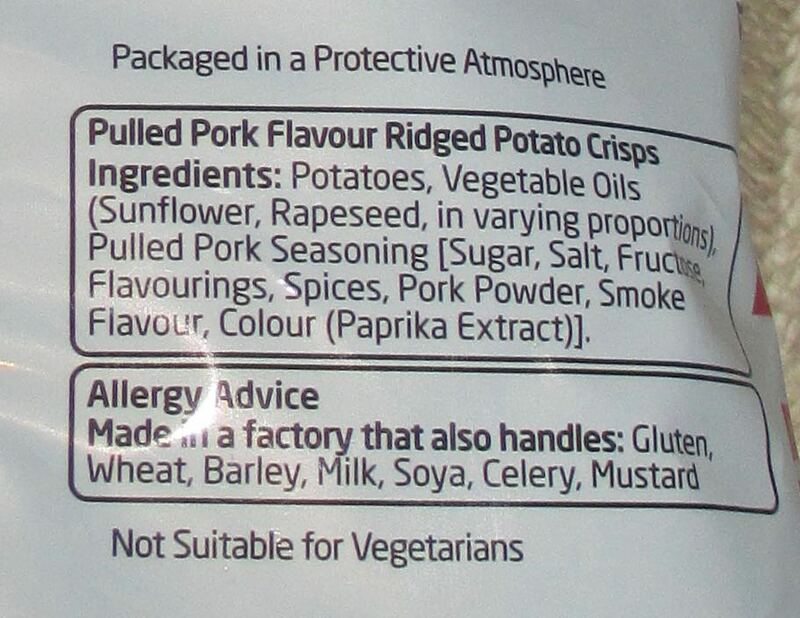 On taste there was a sweet tangy barbeque sauce flavour to the crisps which quickly transformed into full blown pulled pork flavour. 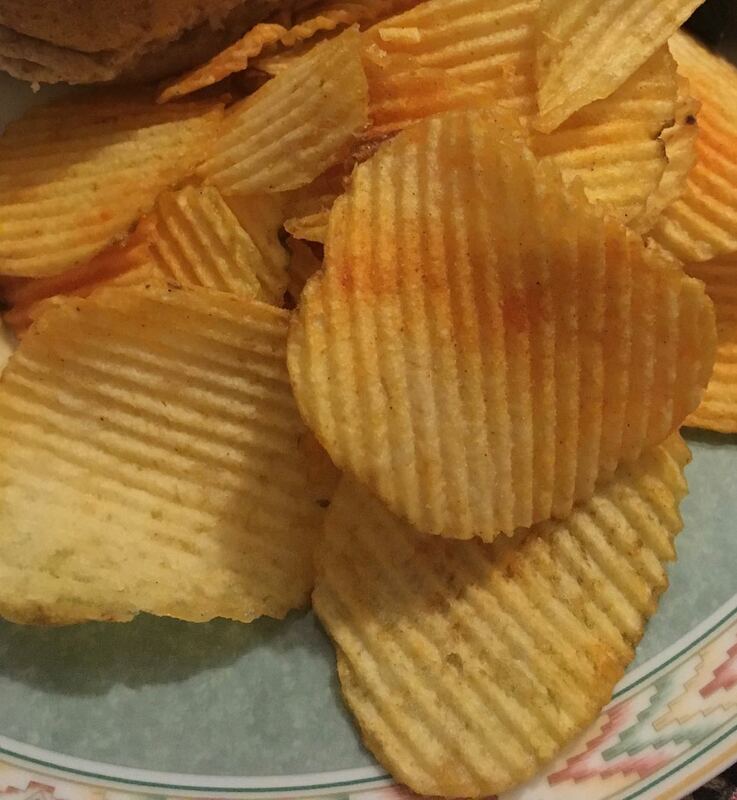 Although there was no smokiness in the smell on opening the packet, the barbecue pulled pork flavour of the crisps transported my tastebuds to smokiness to complete the flavour moving into the aftertaste. Again this reminded me of the smokehouse restaurant that burnt itself to the ground. I definitely have these crisps again, they’re very tasty, very moreish and at least these crisps don’t come with a requirement for a smoke alarm! The 50g packet contains 267 calories, with 16.4g of fat, 1.8g of sugar and 0.65g of salt. See photograph for ingredients. 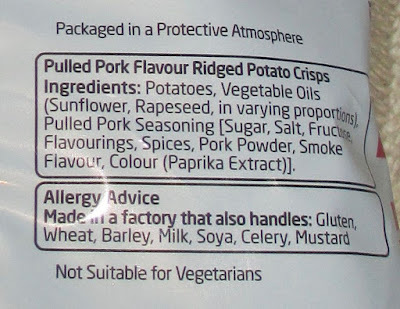 Not for vegetarians as this product does contain pork.